The creators of Grim Fandango, Psychonauts and Brutal Legend aren't making a sequel to their Jack Black-starring heavy metal action game. Instead they're making four new games, one of which is the Halloween-themed role-playing game Costume Quest. According to a first look from UGO, Double Fine's new downloadable game—which is due for a timely release on the PlayStation Network and Xbox Live Arcade on October 31 sometime this fall—will be part trick-or-treat fest, part action-adventure. Players will assume the role of a candy-begging boy on the hunt for his missing sister, who has been abducted by monsters. The player's abilities, and those of AI-controlled trick-or-treaters, will be determined by the costumes they're wearing. 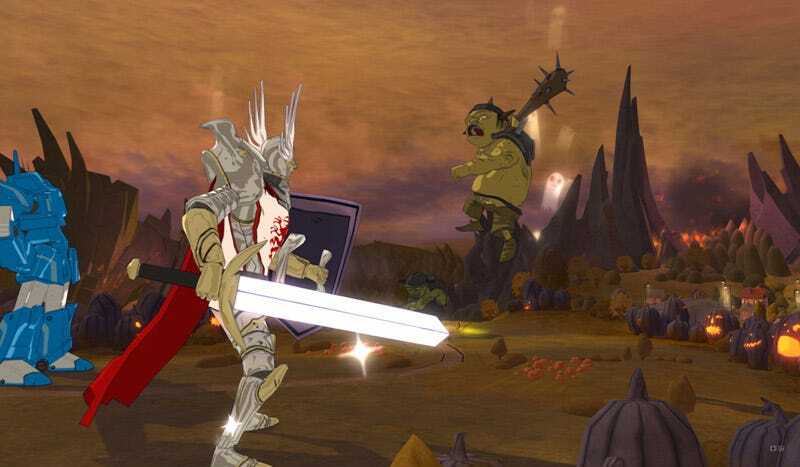 Players will transform into gigantic versions of their costumed characters—like a massive knight or skyscraper-sized mech—when engaged in battle with Halloween beasts. They'll also acquire candy, accept quests from neighbors and build teams of fellow trick-or-treating costumed kids to progress. Costume Quest was concocted and is being lead by Double Fine animator Tasha Harris, with CEO and funny figurehead Tim Schafer serving in a supporting role. THQ will publish the game. More details on Costume Quest at UGO and in the coming weeks.